The 98-card 1997-98 Metal Universe Championship set is the other half of offerings from the Metal Universe arm of Skybox from the 1997-98 year. This one features an amazing intergalactic theme that makes the player on the card seem larger than life. It's an incredible set and it only gets better with its elusive parallel set. The 1997-98 Metal Universe Championship Precious Metal Gems set is, still to this day, considered by many to be one of the best-in-class parallel sets from the 1990s. What makes this parallel set so great is its gorgeous radial holo-foil pattern and its serial numbering to just 50. These cards are breathtaking. Following suit with the other 1997-98 Metal Universe set, the player roster is no less than preeminent. In terms of notoriety, the trend is that this set continues to grow both in value and collectibility. The set has become famous among basketball collectors and general set collectors alike. It's a beautiful set and one with singles predicted to become rarer with each passing year. The key rookie cards include Tim Duncan and Tracy McGrady, while the veterans are benchmarked by the usual suspects like Michael Jordan and Kobe Bryant. Due to the borderless design, the set is highly condition sensitive and chipping is common. Keep this in mind if you're looking to build the set and be aware that condition, especially with the Precious Metal Gems, is secondary to rarity. What this means is that while condition may not always be ideal on the PMGs, just feel lucky you even found one - in any condition! 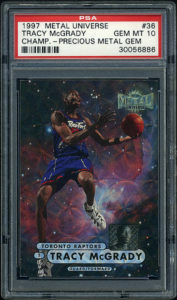 Collector, Nat Turner has given me permission to showcase his collection of 1997-98 Metal Universe Championship Precious Metal Gems basketball cards here. With the exception of a few images in the gallery, everything shown here belongs to Nat.